Hello to all of you fall lovin’, Halloween plannin’, hearty meal makin’ readers. Hope you have had a great weekend and are finding yourselves rested and relaxed. No? Well, we can wish for it, can’t we. MyHandsomeHusband and I have started in on a little kitchen remodel. Nothing too drastic. Just trying to make a little better use of the space we have. We (but mostly “he”) spent a good chunk of time sawing, and nailing, and mudding and taping this past weekend. We made some good progress! More to come about that project at a later date. And now, the week is upon us. Monday mornings can often be a bit overwhelming, I say. There is just something about 5 bazillion loads of laundry, no milk in the fridge, and 5 week days looming ahead that can make a girl search out a little chocolate. Cross your fingers that I find some kind of tasty vegetable instead. Cross your toes that the veggies I find taste like chocolate. Well, we can wish for it can’t we? I have a great Chili recipe for you today. Chili always reminds me of Halloween. Chili and rolls, or cornbread…and a lot of chocolate candy. Yum. 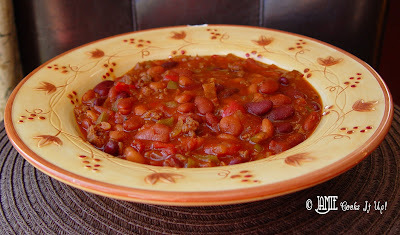 This Three Bean Chili recipe comes from my dear and fabulous friend Cindi. It’s one of the best chili’s I have ever had. It’s not too spicy, which I like…but very flavorful. It’s made with canned beans, which makes it a bonus in the time department. Love that. 1. Put your ground beef in a hot skillet and sprinkle with some salt and pepper. Let it get nice and browned. 2. While your meat is cooking chop up your veggies. 3. Take your can of Stewed Tomatoes and give them a little chop. Don’t try and pour them out onto a cutting board. That kind of mess will urge you to use swear words you never knew you wanted to say. Just stick a handy pair of kitchen scissors into the can and snip away. 4. Grab a large soup pot. Open up your can of beans, but don’t drain them. You want those juices. Add the beans and all of the other ingredients to your soup pot. Stir it all around to incorporate all the goods. 5. Let the chili simmer for 30 minutes. Give it a little taste and add more salt and pepper if you would like. Enjoy! Jamie, is that like a whole garlic clove? You just want one clove of garlic. Not the whole bulb. The little individual sections of the garlic bulb are called “cloves”. Hope that helps! PS..I totally put an entire bulb of garlic in some mayo once when the recipe called for only a clove. It wasn't pretty. I think I still have garlic breath from it. Yum! Chili is a favorite of mine. The more beans, the better. I can't wait to try your recipe. Oh, I love chili recipes! Chili is a family favorite(just don't feed it to the troops on Saturday night before church!). I love throwing chili in the crock pot on Halloween…chili dogs? Oh, and by the way I love chili, fall, friends, family, chocolate, Diet Coke, but not Mondays. made this chili the other night when we had the missionaries over. so delicious! everyone loved it. thanks for sharing! We've made this recipe several times now, including for a football party. I can't tell you how everybody raved about it! Thanks for sharing! Can I Crock Pot this recipe? If I can, is there anything I need to do differently?